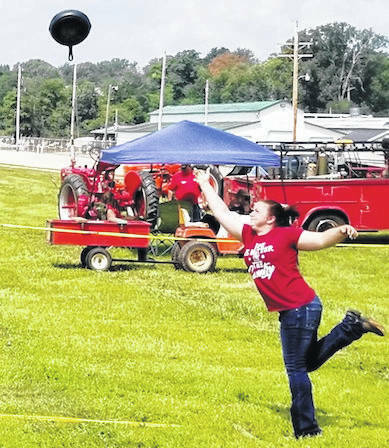 Missy DeForest showing true form at the Farm Days skillet throw. She threw a 5.2-pound, 10-inch skillet 5.9 feet. Paula Derflinger caters to a country clientele with some of her hair clips and accessories. More Farm Days photos on page X and at morrowcountysentinel.com. MOUNT GILEAD — It’s about heritage and a rural lifestyle. 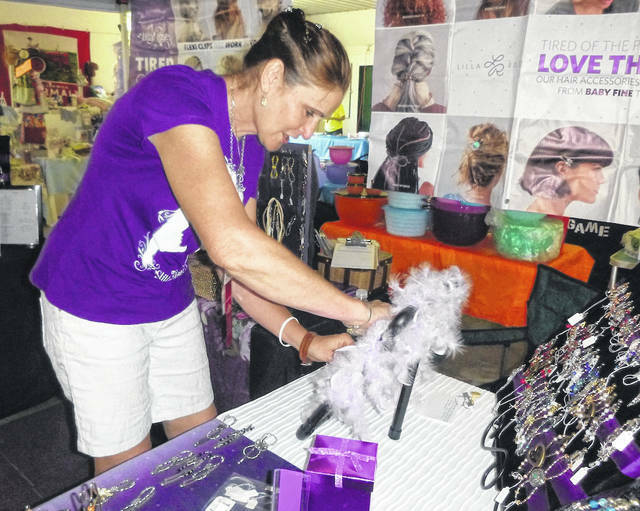 Those were showcased during the 29th annual Farm Days with plenty of food, contests and country crafts. “We have lots of toys and odds and ends,” vendor Rosemary Henault sad Friday afternoon. She and her husband John made the trip from Marysville for the third year to sell their wares. Paula Derflinger sells hair products, but the Croton area businesswoman knows her market. “I’m targeting this show with 4-H clips that have horses on them. I just love 4-H, fairs and old-time farm stuff,” she said. Lisa Wilcox and her two children were busy preparing their booth, Casa de Glitter. “We always get a good turnout; a good group of people. We support each other. This is our sixth year coming from the Iberia area,” Wilcox said. Owen, 7, and Sidney, 12, helped their mom display the “re-purposed and shabby chic” items. “They helped paint a bench until almost 11 last night,” Wilcox said. The Delphos resident had Reo push lawn mowers, dating back to 1947. “This is just something I got into and am a collector. These are similar to the ones I mowed grass with when I was a boy,” Schimmoeler said. Events included an antique tractor rodeo, tractor pulls, a skillet toss and antique tractor parade. Children took part in several contests, along with pedal pull, free railroad train rides, coloring contest and face painting. Food vendors offered a variety of tasty treats during the three-day event.